The master-planned community of Viera was designed with an eco-friendly footprint in mind. Multi-use paths and golf cart crossings have been placed on many of the Viera streets and within many neighborhoods to make Viera travel safe, fun and effective. 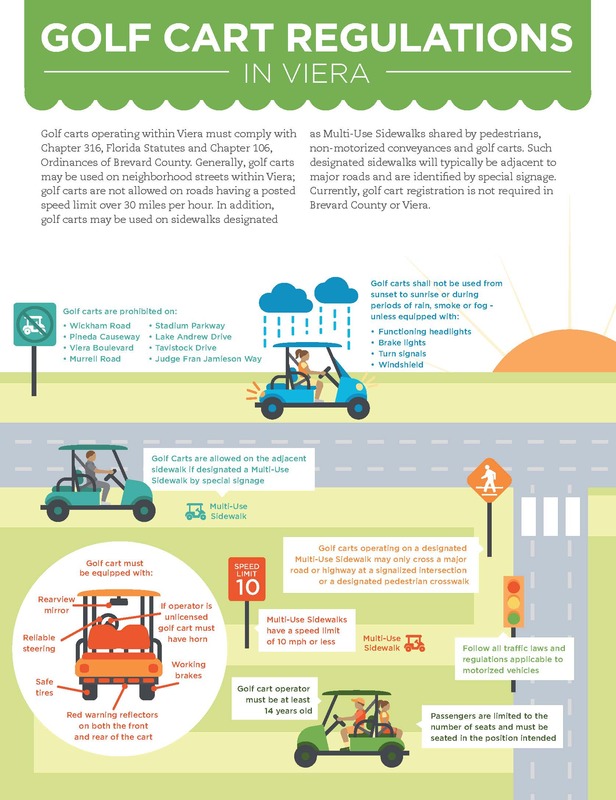 The use of golf carts for travel is permitted on many paths and roadways within Viera. 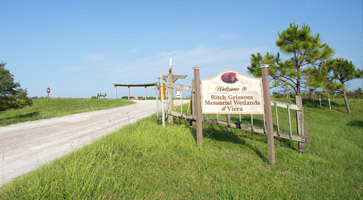 However, golf carts are prohibited on all roadways with a posted speed limit over 30 mph such as Wickham Road, Pineda Causeway, Viera Boulevard and more. Also, golf carts can only cross a roadway with a posted speed limit exceeding 35 mph if there is a signalized intersection or a designated pedestrian crosswalk. 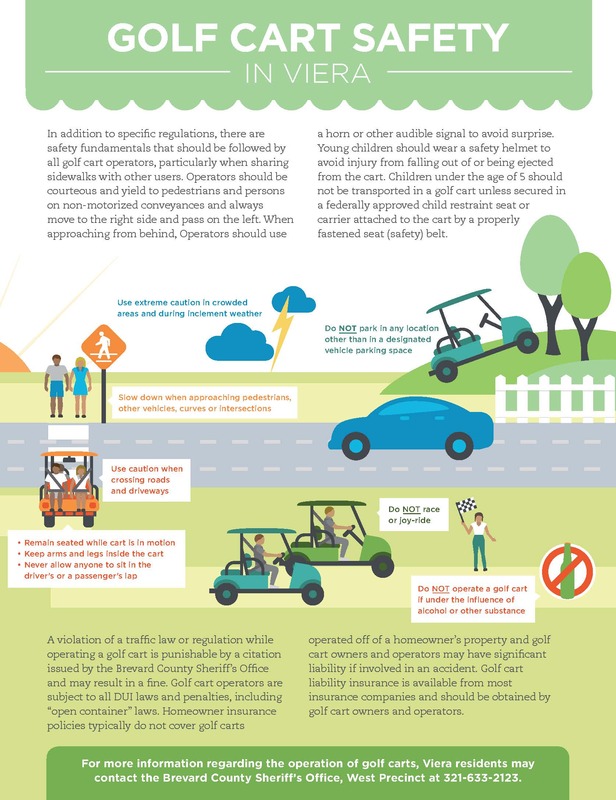 For a complete list of golf cart prohibited roads and additional golf cart operation information, please view the golf cart safety infographic here. There is no registration required for golf carts in Viera; however, all golf cart operators must comply with Florida Statutes, Chapter 316 and Brevard County Ordinance 2016-22. Operators should yield to pedestrians and non-motorized traffic on multi-use pathways by moving to the right side for oncoming traffic and passing other traffic (pedestrians, bikes, skaters, etc) on the left. When approaching non-motorized traffic, operators should always use their horn to signal approach so as to avoid surprising others. Children under the age of 5 should not be transported in a golf cart unless secured in a federally approved child restraint seat or carrier that is properly attached to the cart with a safety belt. Violations of traffic law and regulations are punishable by a citation from the Brevard County Sheriff’s Office and may result in a fine. Golf cart operators ARE subject to all DUI laws and penalties, including “open container” laws. Golf cart liability insurance can be and should be obtained by all golf cart owners and operators from most insurance companies. For more information regarding the operation of golf carts, Viera residents may contact the Brevard County Sheriff’s Office, West Precinct at (321) 633-2123.